Loblolly pine trees in a mixed-growth forest; photo by C.J. Peters on Flickr (noncommercial use permitted with attribution / share alike). Arkansas designated the pine tree as the official state tree in 1939 in recognition of the state's pine timber resources and reforestation efforts. 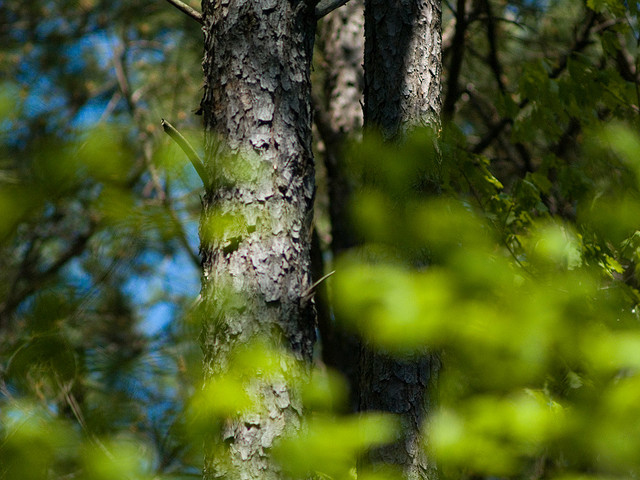 There are four native species of pine in Arkansas: shortleaf pine, loblolly pine, longleaf pine, and slash pine (loblolly and shortleaf are most common). Many telephone poles were once loblolly pines. 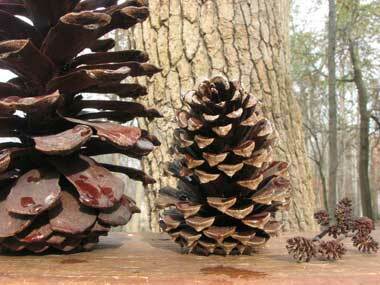 From Arkansas.gov: The pine was adopted as the Arkansas State Tree by the General Assembly of 1939. The loblolly and shortleaf pine are varieties of southern yellow pine found in our state. Both varieties may grow to be 100 feet tall and can be found in our two National Forests, the Ouachita National Forest and the Ozark St. Francis National Forest. Pine cones L-R: endangered Longleaf Pine, Loblolly Pine, Alder; photo by Vicki's Nature on Flickr (noncommercial use permitted with attribution / no derivative works).